There's nothing worse than that awful feeling that you either need to wee or poo, and there is not a loo in sight. Men have things slightly easier than us girls. Not only do we have to put up with pregnancy and mummy bladders, but we just can't whip out a handy appendage and go anywhere. As men seem to delight in doing, particularly if they've had more than a few drinks. Have you ever seen those yellow-filled soft drink bottles which litter some of our busiest highways? Legend goes that male truckies and/or other long distance travellers, who don't have time for a wee break, keep an empty soft drink bottle handy, just in case of an emergency. It seems that our long distance truckers are not always environmentally considerate, as many apparently toss those warm, full bottles, out of the window. Fast and convenient, without needing to make a pit-stop. And how many times have you passed a car, with two doors open, and a trickle of bodily fluid running down the gutter from it? Yep, that's a child who needed to go Right Then And There And No I Cannot Bake it Mum. If, like so many Australians, you have the need to pee urgently and often, you can breathe a sigh of relief. The Pocket Toilet provides a lifeline to those who are regularly caught short. Designed by Ardern Healthcare, the portaloo in a pocket costs under AUD$10, and is being touted as the perfect Christmas present. That's because retailer Halfords discovered that last December, sales went up by 250 per cent. Stocking stuffer anyone? But it's not just drivers who find the Pocket Toilet useful. Apparently, there are always spikes in sales during music festivals like Glastonbury. And the portable portaloo is great for hikers and trampers, and in fact, anyone who wants to avoid long toilet queues and/or disgusting public loos. 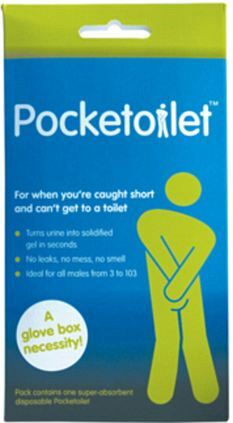 Rest assured, the pocket toilet is said to be very discreet and easily fits into a glove compartment. And while it's aimed at men "aged between 3 and 103" apparently, it can also be used by the ladies. I couldn't find anywhere whether the PT (Pocket Toilet) is okay for number twos as well as wees, but Halfords reassures us that the product contains polymers that turn wee into a non-smelly, non-leaky gel. All in a handy plastic bag. Which generally can usually only be used for one wee, and you need to dispose of it later. But seriously, wouldn't this be great for those long summer car journeys or treks through our national parks where we only want to leave behind our footprints? Not to mention the perfect present for someone who has everything. (Except for a powerful bladder). It's not only long distance truck drivers that fill empty soft drinks bottles with pee. A lot of taxi drivers of a night time do the same thing as they find it hard to find a loo open late at night. Found this out from my ex & also current husband who use to both be taxi drivers. I perfer to stop at a loo when going long distance as it gives the driver & any passengers a chance to stretch their legs. Oooh, I didn't know that about taxi drivers, but of course, it must be difficult. Doesn't seem fair that men get it easier ...Wonder what the female truckies/travellers/taxi drivers do? Sigh. Wow. lol I hope that I don't get this in my Christmas stocking :P I don't really need one as we don't tend to venture out that far. Are you serious? This product actually exists?? Good stuffing filler for a laugh... I guess? LOL! As someone who has a perennially week bladder I really want one of these [maybe not for Christmas] but definitely to be stored in the boot of my car! I reckon that they would be gratefully received at antenatal classes! Wouldn't you have loved to be a fly on the wall in the brainstorming session that came up with that marketing tag line?! Hmmmm, handy. It would be good travelling long distances with kids.